I’m sure yours is, too. We keep our lists on frayed scraps of paper, or canary yellow post-it notes that bristle on our bulletin boards like feathers (and flutter underneath the printer and forever out of sight without our permission). Or we have a sturdy, leather-bound notebook in which we record everything. Or perhaps we have an app, into which we input lists that disappear out of sight with the click of a button. Lists keep the rhythm of the day moving forwards at an even pace. There may be lots to do (sometimes an overwhelming amount), but we know that everything is scheduled, planned, and accomplishable. Sometimes that rhythm is like the jaunty beat of a marching band, accompanying us through the day as we scurry from one task to another — or like the drum in the prow of a dragon long boat — we are encouraged onwards. You can do this. We can do this. Pa-rum-pa-pum. Pa-rum-pa-pum. But, sometimes the rhythm is off. Like the moment when you hear two songs at the same time, both with different melodies and tempos, and they strain against each other in our ears. We take a breath and screw our eyes shut. Our hearts beat unevenly in our chest, struggling to figure out which rhythm to align with. Those are the days when our circadian rhythms need re-tuning, and our lists still believe we are steaming ahead like a brass band. Maybe we feel like listening to the sonorous melodies of Debussy instead of rousing marches by Sousa. Lists aren’t melody, they’re percussion. They're our daily metronomes. They keep us moving in the right direction. However, some days require long melodies that float and soar and allow time between measures to breathe. Those days require colour and texture: a moment to admire a petunia that is unfurling into bloom, its petals a spiral of perfection, like the whorl of a seashell. Or we need to stop to listen to the breeze in the trees and the delicate susurration of the misty rain against the windowpane. On these days I have a tendency to throw my lists into the wind. I spend more time being instead of doing. I take a morning to sit with my journal and dream about life. I breathe deeply and feel the wide margins again, and not like I’m constantly being pressed on to the next thing by the relentlessness of my to-do lists. I brew a cup of tea, select a beautiful pen and a pristine piece of paper, and make joyful lists. Lists of things to write, things to draw, things to read and think about. Rather than cleaning lists and shopping lists. None of these things have a deadline. Most of them don’t even require any action, but just admiration. For example, I have an ongoing lists of things I love, which I return to regularly for a dose of happiness. Written on it are things like: pearls, rainbows, roses in crystal vases, and new notebooks that have never been opened. It’s ok to need rest and throw away the to-do lists in favour of the to-love lists. When I’m overwhelmed, I often devise new, more efficient, and thus more complicated, ways of making lists. I write lists of lists to keep the panic at bay. I schedule reminders in my phone. I cross tasks off, only to rewrite them half-way down the page. I spin in circles, leaving a trail of crumpled paper in my wake. I start to lose my sense of proportion and individuality as I move mechanically from one job to another. I clean the bathroom. Check. I unload the dishwasher. Check. I tidy the toys. Check. Check. After a day of great accomplishment, I climb into my bed feeling like I've become a robot. None of us are robots, we all do things our own way. If you gave five different people the same list, it would be completed in five different ways. Boil eggs. Buy milk. Fold the socks. There are as many unique ways of doing those things as there people on this planet. But we forget our unique abilities and style when we focus on myopically crossing tasks off our lists. A list may provide the framework for the day, but our souls provide the beauty and individuality. Lists are rhythm, but not melody. They are plot, but not story. So, when you write your lists today, remember that you provide all the colour, melody, and story for your day. But you… you are amazing. Twice a month I send out Love Letters. They’re not “newsletters” because, quite frankly, newsletters are boring. No, I send out missives written from my heart about what’s really going on — in my life, in my work, epiphanies I’ve had. The letters are the running story of what it takes to live a heart-centred creative life as a person in this world. They are about my life, but I hope you see a bit of you reflected back too. The Inspiration Letters are my lighthouse, the place I shine my light so we can ALL find our way to shore (and avoid the rocks!). Alongside the rambles I’ll share updates on anything worth knowing including my free community projects and course discount codes. Thank you! I can’t wait to be in touch! A notebook is paper, card, glue, and perhaps a twist of thread to stitch the binding together. But notebooks are magical. As soon as you purchase one at the stationery store and scrawl your name in the front cover, it has been transformed. notebook. There is no other like it in the world. It is your notebook at this specific time and place. A notebook you bought and used two years ago will bear no resemblance to the notebook you bought yesterday. In that interval of time you have changed and matured, and the notebooks will reflect that. 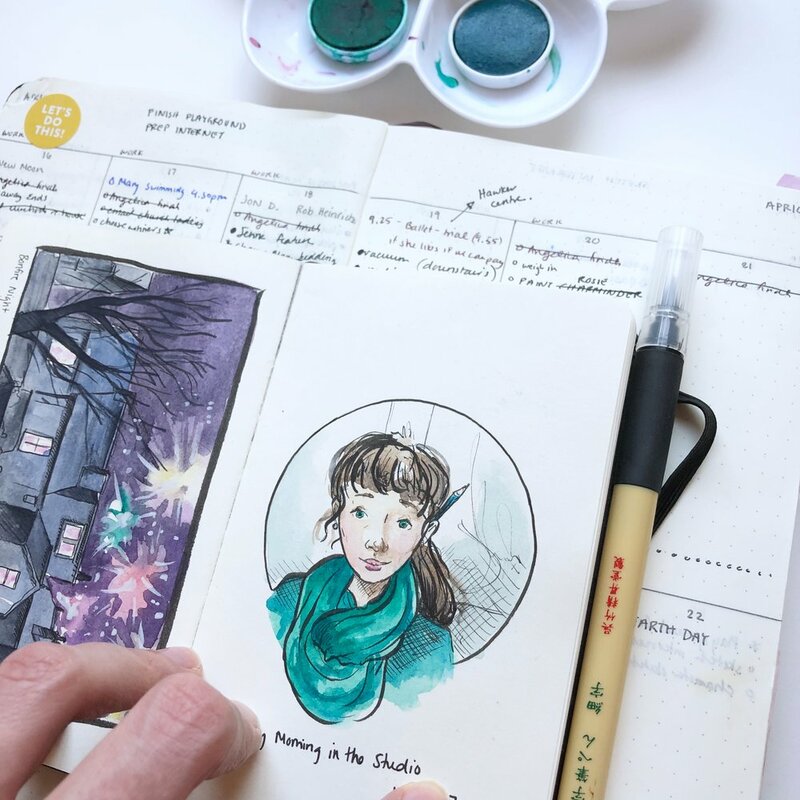 To make your notebook extraordinary, and like no other, all you have to do is sit down and: write, scribble, sketch, glue, paste, cut, doodle, or do whatever else you feel like doing at that moment. And then it is yours. It is a sunny, sweet day: perfect for sitting in the breeze and dreaming. Next door, workmen are clanking, whirring and banging. It gives me a false sense of industry. I'm not doing much, but someone nearby is working very hard. It feels like that work transfers to me by proximity. Like when I'm drinking tea and the washing machine is spinning loudly. I'm not doing anything, but it is working very hard, and so I feel satisfied and accomplished. I have been thinking a lot lately about what work means. My Dad always said that we should "work smart, not hard." And I've spent my entire life trying to figure out what that means. It means being efficient. It means figuring out what is absolutely necessary, doing that necessary thing, and then resting. It is when we rest that we get our best ideas. The trick is figuring out what the necessary things are. Of course, my day-to-day life contains a million and one things I need to do: hanging laundry, cleaning the toilet, making my toddler's dinner, making our dinner..... These all huddle under the umbrella of "keeping detailed to-do lists." My to-do list umbrella protects me from the storm of tasks that constantly hurls itself at my door like a monsoon. I simply write down the things I think are most important. And then I stick to it. Then powering through the drudgery becomes automatic. For example, I don't question whether or not I clean the bathroom on a Wednesday, I just do it. And, while I'm cleaning, I go through the motions by rote so that I can let my mind glide off and spin in circles, thinking about my wonderful, confounding ideas. Meanwhile, I'm focusing on daily drawings, journalling, and doing good work in my studio. What are your necessary things? How do you work "smart, and not hard? Is anyone interested in reading a more detailed post about how I structure my to-do lists so that I can minimize my effort on a weekly basis? Every Sunday evening I sit down with a glass of wine, my moleskine planner and a favourite pen. It is a moment of quietness; a moment in which I can visualize the coming week and all the tasks I need to accomplish. A few weeks ago my writing and illustrating group had an email discussion on how we plan our projects. It was refreshing and enlightening to hear everyone's perspectives. So, I thought I'd share my process with you here on my blog, and I'd love to hear your planning ideas in the comments! On the blank, right-hand page of my Moleskine planner I write down all the things I need to accomplish that week. I divide the list into 5 sections, corresponding to the 5 facets of my career: illustration, writing, blog, etsy and other. If there are specific deadlines or events, I'll schedule them into the calendar portion. If the deadline is still upcoming I'll often write something like "2 weeks left" beside the task in my list. When I have ongoing projects, I make a note of exactly how much I need to accomplish each week. For example, for my current illustration project I have basic tasks outlined for each week until the deadline at the end of this month. This system gives me a structure to know exactly what needs to be done, but also freedom to do it at my own pace as the week unfolds. You might have noticed from the photo that I use the pocket moleskine planner, and not the full-sized one. Even though it's half the size, I can still fit all my notes onto the pages, and the smaller size reminds me to keep my to-do lists and expectations simple. There literally isn't enough space to keep writing tasks ad infinitum. Also, it fits easily into any sized handbag. I love broad margins in my daily routine. I crave blank, unscheduled time when I can reflect on my creative journey and the world around me. Idle time is golden because it's when I get my best ideas. How do you schedule your week? Do you have any tips and tricks for staying sane when tasks and deadlines pile up? What kind of calendar/planner do you use? I'd love to hear from you! Are you interested in reading more about the subject of balance and getting things done? Here are a few amazing blog posts I've read recently. Take a moment to read them, they might just change the way you look at life. Goodbye 2012, you were a good companion for 366 days. And welcome 2013! This morning I pulled out my new day planner and flipped through the pages, wondering what might fill them. Switching to a new notebook is difficult, I become good friends with my day planners. 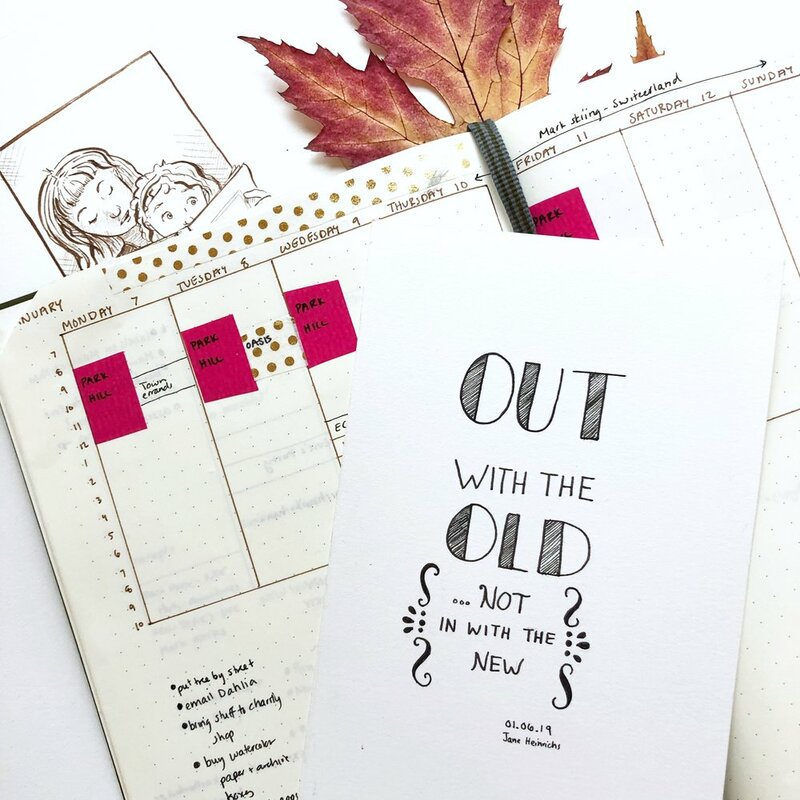 They're never far from reach, and I often use them almost like a journal, not only recording my appointments and lists, but also recording how I feel about life, and what my goals are each week. This new notebook has no dog-eared corners, no scribbled-out appointments, no to-do lists or hastily scrawled reminders. It's fresh and clean, like newly ironed linen. It will take a while to feel completely at home within its pages. I don't usually make New Year's resolutions, except maybe for the constant resolve to keep pursuing my dreams without losing courage. (and we all know how difficult that can be on a daily basis). Having said that, one small resolution is to be more active on my blog. I've let the blog lie dormant for the past year, which was completely necessary. I needed quiet time (read: offline time) to gather my thoughts about who I was creatively. I felt quite vulnerable, and giving too many glimpses into my studio felt too exposed. This time apart has been invaluable, and I feel like I've reached a kind of creative epiphany in the past few months. But now I'm ready to share more of what I'm doing and my creative process. I've missed all you readers and bloggers! And thank you for all your lovely comments, it means a lot that you take the time to leave messages, and they always help to inspire me. And, to start the year off right, here is a little peak at what's on my studio table at the moment. It makes me think of London, and cosy cups of tea while watching the rain lash against the windowpanes.